Brain States are the electrical wave patterns generated in every person’s brain. These waves vary considerably according to the state of consciousness, sub-consciousness or unconsciousness of an individual. The oscillations or squiggles we see in EEG printouts represent these waves. There are four main types of electrical wave patterns generated by every person’s brain. These are Delta Waves, Theta Waves, Alpha Waves, and Beta Waves. Although at any moment all of these types of brain waves may be present; there is always a predominant pattern. Our brain produces each of these wave patterns according to what we are doing at any moment. For instance, during deep sleep our brain predominantly produces the lower frequency Delta Waves. 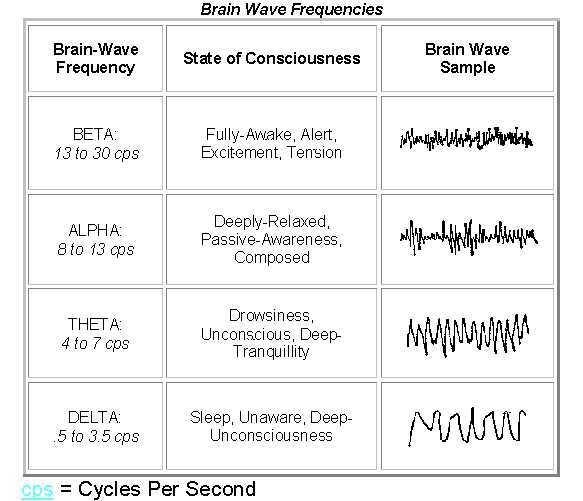 During our normal waking type of consciousness our brain predominantly produces Beta Waves. When we are in a very relaxed and focussed state, for instance during meditation or day dreaming our brain produces a predominance of Alpha Waves. Finally, while we are dreaming or in a very relaxed and creative state our brain produces Theta Waves. Although our brain produces the above patterns according to what we are experiencing at any moment, we can however bring about these states at will using technology. For instance if we are suffering from insomnia and we really need to sleep, then it is possible to stimulate the human brain to produce Delta Waves which will have the affect of making us sleep. Likewise if we are studying and need to retain the information we are trying to take in, then we can stimulate the brain to produce Theta Waves which will have the affect of enabling us to assimilate new information more easily. We can also stimulate the brain to enable us to enter a meditative state more easily. So therefore, our brain not only produces different states according to what we are doing at any moment, we also have the ability to access different states of consciousness at will through using technology. Vibrations from rhythmic sounds have a profound effect on our brain activity. In shamanic traditions, drums have long been used to transport the shaman out of his or her body into other realms of reality through the use of constant rhythmic vibrations. Researcher Melinda Maxfield, studying the Shamanic State of Consciousness, found that the steady rhythmic beat of the drum struck four and a half times per second was the key to transporting a shaman into the deepest part of his shamanic state of consciousness. It is no coincidence that 4.5 beats, or cycles, per second corresponds to the trance-like state of Theta brain wave activity. In direct correlation, we see similar effects brought on by the constant and rhythmic drone of Tibetan Buddhist chants that transport the monks and even other listeners into realms of blissful meditation.